For the past couple weeks, gay players in college football have become an interesting topic. There’s been a lot of speculation about how a team might treat a gay player on the field or in the locker room. Middle Tennessee already knows that answer. From 2008-11, it had the first openly gay college football player on its roster, but never went public about it. 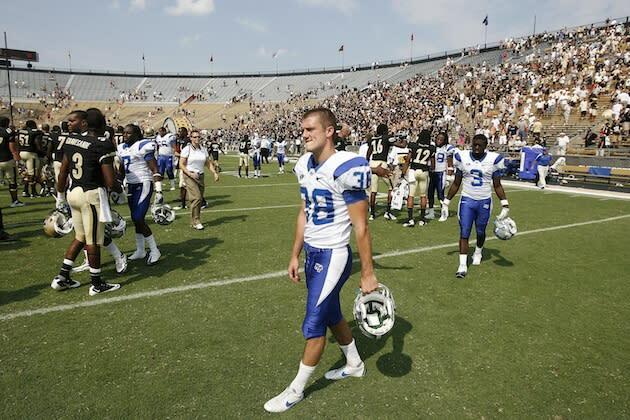 Kicker Alan Gendreau was out in high school and when he joined Middle Tennessee as a freshman in 2008, he had no problem sharing his sexual orientation with teammates and friends. And no one treated him differently. Gendreau, whose story was originally chronicled by Outsports.com, was a four-year starter for the Blue Raiders. He was the all-time leading scorer in Sun Belt Conference history with 295 points and he owns the record for the second-longest field goal in conference history at 55 yards. While teammates, coaches, classmates and friends knew Gendreau was gay, no one talked about it in the media and thus his story was never released until now. "Everyone just saw him as a football player," MTSU punter Josh Davis told Outsports.com. "He was just one of the guys. The fact that he proved himself on the field, there was a respect for him. He's a good guy. He's a lot of fun to be around. With all the coaches and players, he had a good relationship." But after college, Gendreau walked away from the game because his senior season numbers weren’t good enough to earn him a spot on an NFL team. A year later, he wants to try again and in turn become the first openly gay male player in major athletics. Gendreau has been staying fit during the past year and has a renewed drive to make an NFL roster. He knows the road will be difficult, but if he can get into a camp, he thinks his talent will do the rest of the work. "It's totally legit that he can get into the league," Minnesota Vikings punter Chris Kluwe told Outsports.com. "Place-kicking is all about doing this one specific skill set. And if you can do that, you can make it whether you’ve been out of football for one year or 10 years." Gendreau said he just wants to be judged by his football ability and hopes his sexuality doesn’t overshadow his talent. He also hopes by coming out and showing that an openly gay man can achieve his dream of becoming a professional athlete, it will inspire others to believe the same. "All those kids playing sports in the South or anywhere else," Gendreau told Outsports.com, "kids who are afraid to be themselves, I just want to put my arm around them and help them. And if my story can do that, I figure I owe it to them to give it the best ending I can."